Good question! To start the research, I thought I would go back to the worst winter I remember in Indiana, 1978. 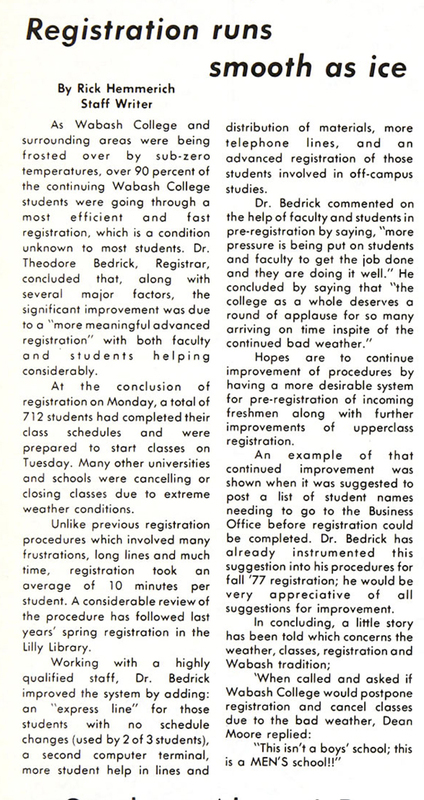 To my astonishment classes were NOT cancelled in ’78. Here is what I found as I tracked back through the Bachelor. Within two weeks of that article, the school cancelled classes on a Friday. 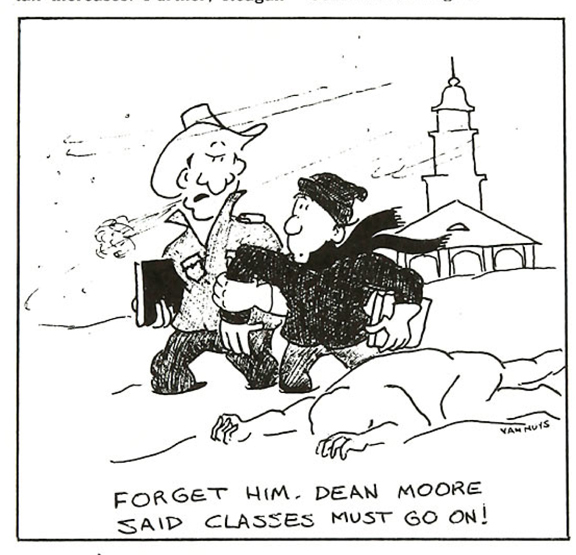 The headline of that piece read, “Brrrrr!” with a subhead of, “Elmore Day at Fifty Below.” Elmore Day was a lovely day in the fall when President Seymour cancelled classes unexpectedly. The conditions in 1977 were just awful, blowing snow with winds of 45-60 mph causing a wind chill factor of 65 degrees BELOW ZERO. This article by Jim Garrison tells the full tale. There were worries about natural gas supplies, exhortations to turn down the thermostat, and calls for businesses to cut back on gas usage. It seems clear that this would have played into any decision to cancel classes. The next year is the one I remember so clearly, the Blizzard of ’78 was a big one with loads of snow, plummeting temperatures and wind, lots of wind. In the days before the internet, we played cards and games and stayed inside for days. Yet classes were not cancelled at Wabash. Winter storms come and go and January is usually the worst month for such weather. Bachelor stories of freezing temps, heavy snow and strong winds are common in that month across the years. One line runs through them all, classes are not cancelled at Wabash. 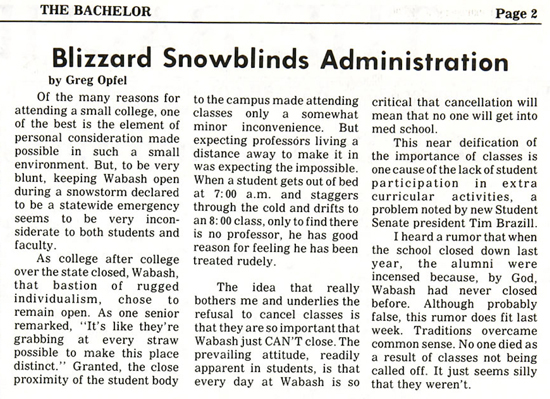 With this in mind, it was notable that earlier this January, during the Polar Vortex, Wabash did close its doors. The county declared a snow emergency asking everyone to stay off of the roads, period. But as class was not yet in session, the 37 year streak continues. I close by saying that this winter Campus Services has worked away, often late into the night, trying to keep the roads and walks cleared or at least passable. Sometimes that involved starting at 3 or 4 a.m. It has been a long winter and the folks at Campus Services deserve a big thank you for their hard work! Here’s hoping that we will soon move into spring! In the meantime, take care and stay warm!